Last week something magical happened at the movie theater. As I walked into the theater to see Home, I was surrounded by a sea of little black girls of all hues as they held the hands of their parents, eager to see the new animated film Home, starring Rihanna as a little Caribbean girl named Tip. The last time I saw a movie theater filled with that many little black girls was with the release of Annie. Who knew that a movie about a little red-headed orphan that now starred a little black girl wearing a “natural” would draw so much fanfare from little girls? Who knew that a film about a girl and her alien friends would draw such a crowd? Home and Annie both proved that representation matters. Dreamworks’ Home may not have been the blockbuster success the studio was looking for, but so many black parents were able to bring their children to a movie in which the main character looked like them. 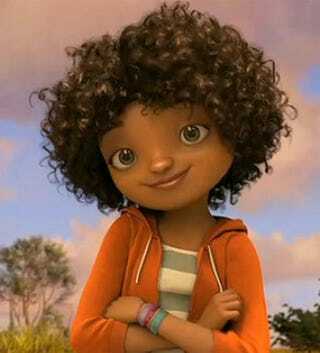 Although Home got a Dreamworks face-lift and wasn’t exactly a page-by-page replica of the book, with changes to Tip, she is undeniably a smart brown girl, with an accent to boot. But there seems to have been something off when it came to the marketing and merchandising of Home. There have been reports that Rihanna’s character, Tip, is missing from billboards in certain areas, with only the aliens being featured. If you happened to live in an urban area, you’d see Tip, but say, for example, you’re in the suburbs of Los Angeles—then you’d only see the aliens being advertised. And it doesn’t stop there. As with many animated movies, there’s always the branding and partnerships with corporations, especially if those corporations cater to younger children. One father noticed something was amiss when he took his children to McDonald’s to purchase a Happy Meal: The Home characters were being promoted, but apparently not all the characters. All they wanted was a toy Tip. Although I’m not a fast-food person, I have made specific trips to McDonald’s to pick up Happy Meals just because of the toys. Imagine how many little kids would be happy with a miniature Tip? Imagine how many little black girls would carry around a miniature brown doll that looks like them? When asked why Tip wasn’t a featured toy and why Oh, the alien, was the only available toy, McDonald’s mentioned marketing. “We have a comprehensive marketing mix in support of the film Home. Tip is featured significantly throughout our in-restaurant signage … and digital-engagement initiatives, as well as in the TV commercial. You are correct that the Happy Meal toys feature Oh. In the movie, Oh changes color when his emotions change. We thought this was a fun aspect of the story to create a unique group of toys for child play and interaction,” Lisa McComb, a McDonald’s representative, told The Root. It’s too bad McDonald’s didn’t realize that having a toy that represents little black girls could also have been a unique aspect of interaction. Especially if the children interacting with the toy looked like Tip. In the world of marketing and entertainment, representation matters. You can take a look at the success of television shows like Empire, Black-ish and Fresh Off the Boat and the fact that people are tuning in to see faces that look like their own. Some may say that Dreamworks and McDonald’s both missed out on a major marketing opportunity when it came to merchandising Tip instead of a bunch of aliens.